This week’s episode of Legends of Tomorrow presents a fun take on George Lucas’ path to becoming a director — but the true story is even more amazing. Legends of Tomorrow, The CW’s show about a group of time-travelling DC superheroes, had some fun with cinema history this week. In the episode, the group goes back to the ‘60s, where a 23-year-old George Lucas gets caught in the middle of a showdown on a movie set between the Legends and the Legion of Doom. The traumatic experience leads Lucas to abandon the movie business altogether and pursue a quiet life as an insurance salesman. Alas, two members of the group were inspired to become who they are by Star Wars and Indiana Jones. Without Lucas’ films, they lose their powers — so the Legends take it upon themselves to convince Lucas to get behind the camera again. But if the makers of Legends of Tomorrow wanted to capture a dramatic moment in the young George Lucas’ life that changed the course of history, they didn’t have to invent one — because the filmmaker’s real origin story is dramatic enough already. Long before he took a real interest in cinema, when he was just a kid in Modesto, California, Lucas had the need for speed. He was obsessed with cars and racing, and he used the money he earned working as a delivery boy at his father’s stationery store to buy his first car an Autobianchi Bianchina, an Italian minicar based on the Fiat 500. He wasted no time souping it up, of course. He put in time working as a mechanic at a local Renault garage, and worked on his own car at the garage after hours. When he wasn’t at the garage (or at school, where he was barely scraping by), he was cruising the main streets of Modesto, competing in street races and discovering girls. While many of the filmmakers that emerged in the late ‘60s and early ‘70s grew up steeped in cinema, the truth is that the movies just didn’t hold that much appeal for the teenage George Lucas. And then, on June 12, 1962, just three days before his high school graduation, life caught up with George Lucas. He was driving his hotted-up Autobianchi Bianchina home from the library when his classmate, Frank Ferreira, tried to pass him at high speed in a Chevrolet Impala. Lucas didn’t see him, went to make a left turn into his driveway, and got broadsided by Ferreira. Lucas’ car rolled several times before wrapping around a tree. A picture of the wreck ran on the front page of The Modesto Bee the next day. Ferreira, behind the wheel of the bigger, heavier Chevy, walked away with barely a scratch. And somehow, Lucas survived, too. Barely. On the third roll, Lucas’ seatbelt snapped, throwing him from the vehicle. A bystander, who happened to be in the right place at the right time, pulled Lucas clear of the wreckage and called an ambulance. When paramedics arrived on the scene, Lucas wasn’t breathing and he had no heartbeat. He was rushed to the hospital in critical condition (in other circumstances, he probably would have enjoyed the high-speed race against time). His lungs were crushed, and he hovered close to death in intensive care for the next two weeks. He pulled through, but had to spent several months convalescing in hospital. 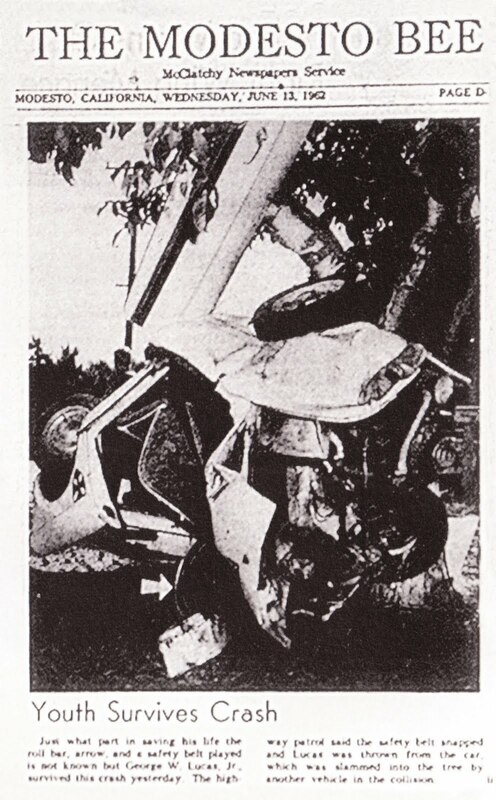 “I spent some time in the hospital, and I realised that it probably wouldn’t be smart for me to be a race driver — especially after this accident,” Lucas told Starlog in 1981. “Before that first accident you are very oblivious to the danger because you don’t realise how close to the edge you are. But once you’ve gone over the edge and you realise what’s on the other side, it changes your perspective. “I was in a club with a lot of guys who were race drivers — one of ‘em went on and drove at Le Mans — and he eventually quit too because of the same thing. You see what the future is there, and you realise that you’ll probably end up being dead. That’s where most of them end up; it’s inevitable, because the odds are if you stay with it long enough that’s what will happen to you. Lucas enrolled at Modesto Junior College, where he substantially improved upon his mediocre high school grades while studying psychology, anthropology and philosophy. He also began working as a photographer. Lucas had always had a knack for graphic art, and he combined that with his love of racing to begin taking stills of sports cars. He happened to meet Haskell Wexler — later voted one of the 10 most influential cinematographers in history by the International Cinematographers Guild. A racing enthusiast himself, Wexler had a car built by a mechanic Lucas was working for at the time, and they became friends. With Wexler’s encouragement, Lucas enrolled at the University of Southern California’s film school, where he could pursue the new love of his life. Of course, it’s not exactly true that movies replaced Lucas’ love of cars. If anything, his two great loves supplemented each other. One of the short films he made at USC, 1:42.08 — alternatively known as 1:42.08: A Man and His Car — was a visual tone poem depicting a Lotus 23 race car going at full speed. American Graffiti, of course, was Lucas’ love letter to his street-racing youth (Haskell Wexler served as a visual consultant on the film). Even Star Wars, with its souped-up Corellian freighter and innovative editing that conveyed a real sense of speed in space, probably couldn’t have been made by someone that didn’t have petrol running through their veins. It’s no coincidence that Lucas has always been drawn more to editing, and the editor’s ability to slow down and speed up the viewer’s perception of time, than he has been to writing and directing. “I like racing. I love the speed and I'm a very kinetic person in terms of filmmaking,” Lucas told Empire in 1999. That Lucas survived his car crash was, frankly, miraculous. Not just for him, but for all of us who have been affected by his films and their enormous influence on pop culture. If Lucas had died, of course, he would never have made his mark on the world — but, if he had walked away without a scratch, he probably wouldn’t have made his mark either. It was his brush with death that forced him down that path, and if any of it had happened any other way, you wouldn’t be reading this right now. Yes, it’s lucky that he survived. Or maybe it was something else. Remember the bystander that pulled Lucas clear of the wreckage? 53 years after the crash, we finally found out who that was. “The Star Wars saga is about a series of seemingly chance encounters,” Kathleen Kennedy, the legendary film producer who replaced George Lucas as the President of Lucasfilm, told the crowd at the premiere of Star Wars: The Force Awakens in 2012. “In 1962, an 18-year-old boy named George Lucas was drag-racing his car. He skidded out of control and wrapped his hot rod around a tree in Modesto. Kennedy’s tale of incredible coincidences didn’t stop there, either. “Fifteen years later, I stood in line for A New Hope, just like many of you, only to find myself later going to work with George Lucas and his best friend, Steven Spielberg. “Steven’s next movie was Raiders of the Lost Ark, which was produced by George Lucas and written by Lawrence Kasdan. “After its release in 1982, a box of Super 8 movies Steven made as a kid had long been lost, but were found. I hired two 16-year-old young filmmakers to restore them. One of those boys was JJ Abrams. “We paid him $300. Then we watched for 30 years as his career flourished. “When George offered to have me step into one of the greatest jobs in show business, taking the reins of Lucasfilm, ushering in new Star Wars films, only one person seemed perfect to direct that first movie. JJ has incredible talent, a love of Star Wars, and enormous respect for George. Was it luck that George Lucas survived that car crash? Maybe. But in my experience, there's no such thing as luck.